Sir:—It is my duty to inform you forthwith that an insurrection is in progress at Harper's Ferry, and on the Maryland side, in which free negroes and whites are engaged. Pres't B. & O. R. R. Co.
Pres't. of the Baltimore and Ohio R. R. Co.
Sir :—Your communication of this day has been received, and, acting upon such reliable information, I have ordered a detachment of five companies from the First Light Division to be in readiness to proceed to Harper's Ferry in the four o'clock train of this afternoon. You will oblige me by making the needful arrangements for their transportation. 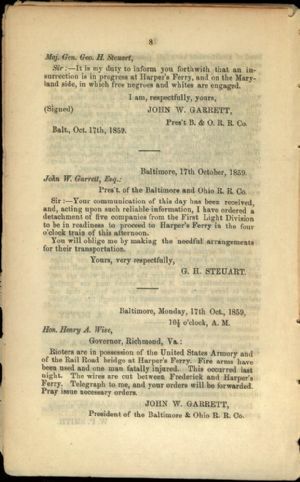 Baltimore, Monday, 17th Oct., 1859, 10 o'clock, A. M.
Rioters are in possession of the United States Armory and of the Rail Road bridge at Harper's Ferry. Fire arms have been used and one man fatally injured. This occurred last night. The wires are cut between Frederick and Harper's Ferry. Telegraph to me, and your orders will be forwarded. Pray issue necessary orders. JOHN W. GARRETT, President of the Baltimore & Ohio R. R. Co.
Baltimore, Oct. 17th—10.30 A. M.
The United States Armory at Harper's Ferry is in the possession of rioters. The wires are cut west of Frederick. from the conductor has reached this office. The presence of United States troops is indispensable, for the safety of Government property, and of the mails. A special train will be ordered to be in readiness for any troops ordered to be sent. Secretary Floyd has been telegraphed. The rioters are more than two hundred strong. 17th Oct., 1859—10.20 A. M.
Telegraphic advices present a serious affair at Harper's Ferry, where United States Armory and our bridges are in full possession of large bands of armed men, said to be abolitionists, and thought to be armory men. The guns from Armory have been taken for offensive use, and the leaders notify our men that no trains shall pass the Armory and bridge. Our officers were fired upon, and a laborer instantly killed. The wires being cut we get our advices from next station, but they are entirely reliable although they may be exaggerated in some degree. Can you authorize the government officers and military from Washington to go on our train at 3.20 this afternoon to the scene, or send us full authority for volunteers from Baltimore to act. We will take them up on afternoon's Express if necessary. Please advise us immediately what the government will do, our operations on road being in the meantime suspended. Pres't B. & O. R. Co.